I'm watching the first round of this year's Master's Tournament and Jordan Spieth just finished 16th with another birdie to get to -6 under par (so far). I just can't say it enough but this kid just amazes me with his focus and how well he plays Augusta National. So, what is your take on the tournament so far? Is it living up to the hype that came into this year's event? Who are your picks for the Winner's circle come Sunday? Did anyone else see Tony Finau's poor luck in the par 3 contest? His dislocated ankle did not seem to bother him today as he came in with a -4 (68)!! 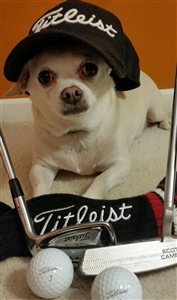 I also follow Team TITLEIST Abby on Instagram and she shared some neat photos from Augusta the past few days! I enjoyed seeing her photos of the pimento cheese sandwiches, the practice areas and more. I have to say that it was one of the better Masters Tournaments. The Final Round had echoes of 1986 - with Jordan shooting a 64 and nearly winning the tournament. Nonetheless, Patrick Reed found his nerve and held his own to hold off both Jordan and Rickie.